This is just a small profile of Manuel E. Amador, one of Casco Viejo’s residents, a great painter, creator of the universal language known as Panamane and designer of the Panamanian flag. There are places that exist with such vitality, intensity and magnetism, that they almost seem to attract and generate the most interesting characters. Such is the case of our beloved Casco Viejo, so full of unforgettable souls. From the barbers, working outside and sharing the juiciest gossip, all the way up to the old family patriarchs who still live at their original homes and know the neighborhood’s history like the palm of their hand. There is, however, one such figure; so peculiar that he is like a spiritual grandfather to all the great characters at Casco Viejo: eccentric, brilliant, owner of an incredibly rich and vital path, one that accompanied him until his last moments. His name was Manuel E. Amador, though he was usually known by the name Manuelito. He was the son of the then first president of the young Panamanian republic. Many saw him in his last years, during the national day parades at Casco Viejo carrying in his hand a tiny Panamanian flag replica. Nobody suspected that that elderly yet jovial man, akin to a young child waving happily their national tricolor flag, was the same one who, in his youth had designed it several decades ago. His full name was Manuel Encarnación del Carmen Amador Terreros, but everybody knew him as Manuel E. Amador, and those familiar to him could simply call him Manuelito. This diminutive was completely backed up by the glimmer of childish wonder in his eyes, a glimmer that would be with Manuelito until his last moments. He was born in 1869 and throughout his career as a civil servant of the young republic, he worked in several different positions. However, beyond his bureaucratic achievements, his future pictorial work, and even beyond having developed a prototype for a universal language, Manuel E. Amador is recognized for having been the designer of the Panamanian flag. 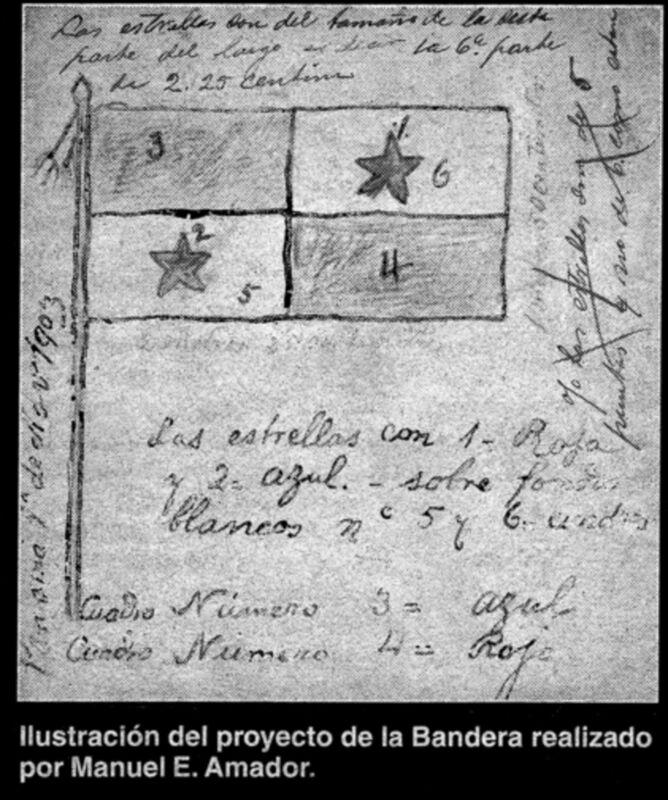 Courtesy of the blog: “https://simbolosdepanama.wordpress.com” Manuscript of the origin of the flag, of a photostatics reproduced originally in negative by Dr. Ernesto J. Castillero in his work History of the Symbols of the Panamanian Nation, first edition. In 1902 Philippe Jean Bunau-Varilla persuaded the United States to build the Canal on the Panamanian Isthmus. Secretly, Bunau-Varilla was devising a constitution, a flag and a canal treaty for the about-to-be-born nation. A month before independence, Buneau-Varilla showed the independence leader and future first Panamanian president, Manuel Amador Guerrero, a design for the flag, which had been created shortly before in the United States. A unanimous rejection on behalf of the separatist leaders followed. Independence however, was fast approaching, and a flag became necessary. For that reason, Manuel Amador Guerrero entrusted his son, Manuelito, owner of great skill for drawing, the task of designing the national emblem. Thus, our flag was speedily born through the night of November 1, 1903. The red and blue colors were symbols of the two parties that marked the life of the isthmus: Liberal and Conservative, while white suggested peace between the two, which had made possible the new nation’s birth. First flag hoisted over the Republic of Panama at Colon, Nov. 5th 1903. Six years after independence, Manuelito’s father, the first Panamanian president, passed away. His disappearance meant a considerable inheritance was suddenly in the hands of the young artist. With his new wealth he flew to New York, where he would wholly unfurl and give flight to his multifaceted genius’ wings. In 1909 he entered Robert Henri’s pictorial studio, and between 1910 and 1914 created most of his plastic artworks, mostly composed of vivid exploration of the female body. “Untitled”, 1913. Manuel E. Amador. Drawing, charcoal on paper. Part of the permanent collection of MAC Panama. Art, however, was not enough. His greatest concern was the creation of a universal language, one that would be able to cross and abolish linguistic boundaries as well as helping to forge world peace; such a language, in honor of his homeland should carry the name Panamane. For this formidable enterprise, for which he hired countless world-class experts, Manuel E. Amador spent enormous amounts of energy, and squandered almost all of his assets. In 1926 he returned to Panama, where due to the seious decline in his personal fortune, he was forced to work, once again as a public official. His main obsession would continue to be the development of the new language. That is why in 1928 his most profound aspirations became true when the Secretariat for Public Instruction recognized the intellectual property of the Panamane language. Eight years later “Fundamentos del Panamane: una lengua universal” would be published. Despite the remarkable linguistic ambition of the project, it barely managed to arouse a pale mixture of disinterest and skepticism among the vast majority of the Panamanian intelligentsia. Far from discouraging Manuelito, he found himself devoted to contributing enthusiastically to the distribution of printed well-known texts translated into Panamane among the schoolchildren of Casco. Not long after however, this enthusiasm would be replaced by the revival of an almost elderly Mauelito’s artistic fervor. So, he set up a modest studio to paint, located in Casco Viejo, very close to the presidential palace. There, he lived his last years, recording the intense beauty of his female models, and crossing Casco Viejo’s luminous labyrinth with all the poetic power of his forever alive, indestructible gaze.